So, you want to keep ferrets? I realise that I’m turning into a stereotype here by my last post on Lancashire Cheese and now ferrets, however, recently I’ve had a few people approach me as they’re thinking about keeping ferrets and want to know how to get started. I thought I could turn this into a nice blog post. They’re cute. They are absolutely hilarious. They take up very little room as they’re so small. They sleep up to 20 hours a day (when you’re at work and when you sleep) so they can be left for prolonged periods of time. They’re highly intelligent and love company. Because they sleep so much they are extremely energetic and playful when they are awake. Think a cross between kittens and puppies who never grow up. Older ferrets are still as energetic, they just sleep more. They can also be taken for “walks”, which can be a problem if you don’t like attention or want exercise. It’s more like herding cats than walking a dog. In addition ferrets are also hypo-allergenic. So if you want a furry pet but thought you were allergic, go for it! Why not to get Ferrets? They smell and they bite. This is the common mosconception of ferrets. And yes, both are true. Any animal that lives outside will smell more. Keep them inside and they will smell less. Muck them out, clean their bedding and bath them regularly and you can keep on top of it. In my opinion they smell less than dogs and it’s a more pleasant smell; honey musk. With the biting, yes they do nip. But again the more they’re used to being handled the less they will bite. Ferrets do have personalities and you’ll get to know their biting tendencies (it’s more about communication). For example Perl will nip faces and the inside arm. Ruby likes to bite toes, especially those she finds under blankets! Knowing where to go to get ferrets is a mystery wrapped in an enigma. Personally I went to my local butcher to ask where he got his. Turns out there is an animal dealer in Walmer Bridge called Len. Armed with a name I used the power of google and found him! Two ferret kits for a fiver each. Done! These were from working ferret stock, rather than pets. However this really doesn’t matter. I’d recommend looking online for your nearest ferret rescue. There are loads of them littered about the UK and they’ll always have lovely fuzzbutts needing a new home. I went for two kits, mainly because I didn’t know any better and also because tiny baby ferrets are incredibly cute. But, be warned. With baby ferrets comes much training. Luckily I was able to work from home when I got Ruby and Perl. I have invested a *lot* of time in training them. This involves both toilet training AND how they interact with humans. I have had huge success in the former, and mixed in the latter. I’ll go into training later. Getting an adult ferret, especially from a rescue, you’ll find is already trained and happy to be handled by humans. So unless you do have hours and hours every day to spend with your ferret, get an adult. Never, ever, ever get just one ferret is my advice. They’re very sociable animals, even curling up to sleep together into one big, never ending ferrety pile. They love to play. I find that if one of mine decides they want to play with me and I’m busy (this usually involves a quick nip or a ball of fur launching itself at you) I can generally point them at the other ferret and a fight ensues. It’s also the best form of entertainment known to man. Nothing else is sure to brighten your day than watching the intricate battles between ferrets. There’s wrestling, ambushes, hiding, leaping, weasel wardancing, dooking, falling off beds and sofas mid-battle… They love it as much as the spectators. So basically with ferrets, the more the merrier, but beware! They’re not guaranteed to get on and ferrets can be very territorial. So make sure you get a pair (or more) who do get on before you bring them into your home. I’ve found Perl is very laid back and is quite happy for any ferret to come to his home, as long as he can sniff and possibly play. Ruby on the other hand gets very viscous, attacking the new ferret and actually drawing blood! You need to ask yourself whether you’re going to keep your ferrets indoors or out. Living in a small flat in the city centre I didn’t have much choice there. If you’re going for outdoors I’d recommend a very large rabbit hutch inside a shed (or outbuilding) which you can provide heating in the very cold winter and cooling in the summer (ferrets are very susceptible to heat) . If you go for indoors I’d start off with a cage. 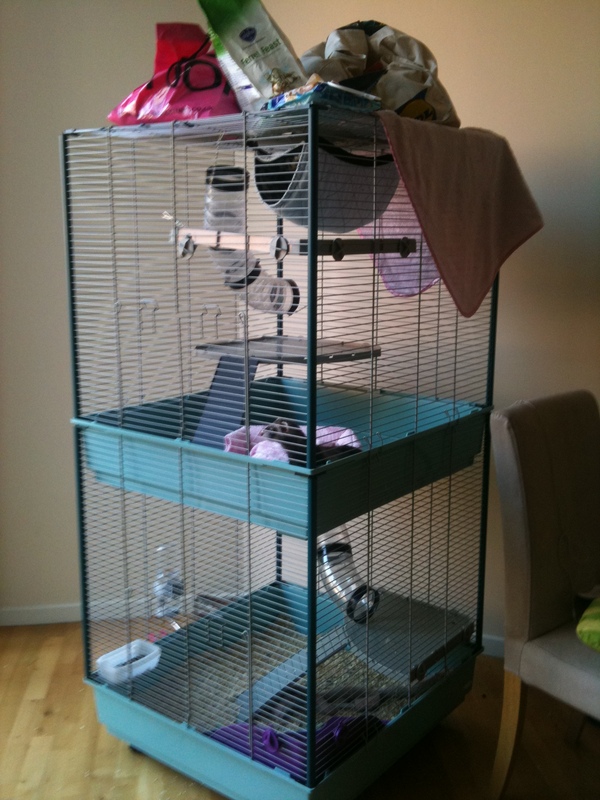 A large cage suitable for rats or ferrets is good. If you do plan to leave the ferrets on their own for more than a day then make sure you give them plenty of room to play! Once litter trained it’s perfectly feasible to leave your fuzzbutts roaming free around the house like cats. I even know of a lady who has a few acres of land and allows her ferrets to roam free outside. They always come back to their warm beds, water and food. However I wouldn’t recommend this. In my experience ferrets have the homing instincts of a newt. 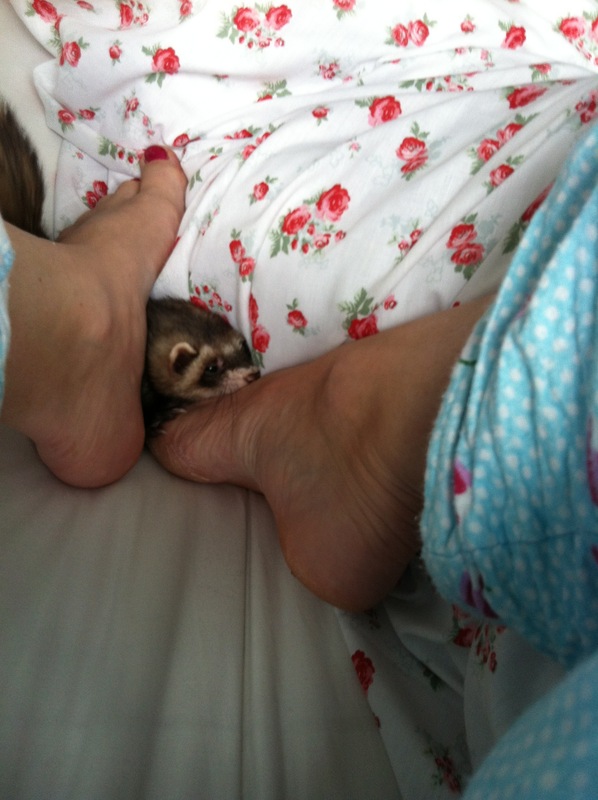 I’ve written a blog post on this before, but it’s the single most important part of ferret ownership. Before bringing a ferret into your home look around for any nooks, crannies, holes or escape routes your little Houdini could find. Get down on your hands and knees if you have to. Open cupboard doors, push and pull at kickboards… Seriously, these tiny monsters are clever. They will figure out a way to get to something they want; they climb, they leap, they’re pretty fearless and have a great sense of adventure. Plants will be executed. The soil will be seen as a lovely dig box especially for fuzzles and your plants will become casualties. Cut flowers will be eaten. Glasses of liquid (water, wine, beer juice, they aren’t fussy) will be investigated, knocked over and drunk. Ornaments will be knocked not only over, but then pushed off windowsills. On the upside ferrets do not chew! SO all your wires are safe. ( : Remember they love small, dark and warm hidey holes. They will go to sleep there and you will not be able to rouse them. I think that’ll do for the basics and preliminaries of anticipated ferret ownership. I’ll follow this up with tips and tricks for ferret training. Please leave comments here of any other subjects you’d like me to cover.